After a disappointing first game from the Tampa Bay Rays, the red hot Phillies are on a four-game winning streak to open the second half of the season. I still don’t trust the Philadelphia Phillies to do anything but lose, but now we’ve got to temper our expectations. The Rays don’t hit. I like a progression here because I think the Tampa Bay Rays are simply the better team. They’ve got much better pitching than the Phillies and once again hold a slight edge in this one. On the road, I think it’s tricky and we shouldn’t be too aggressive, but with Jake Odorizzi closing out this series, I like the Rays. The computer actually likes the Phillies at home here, but I just don’t think the Phils have enough to hang here. Yes, they’re off to a great start, but I really think it’s a little bit of a fluke. 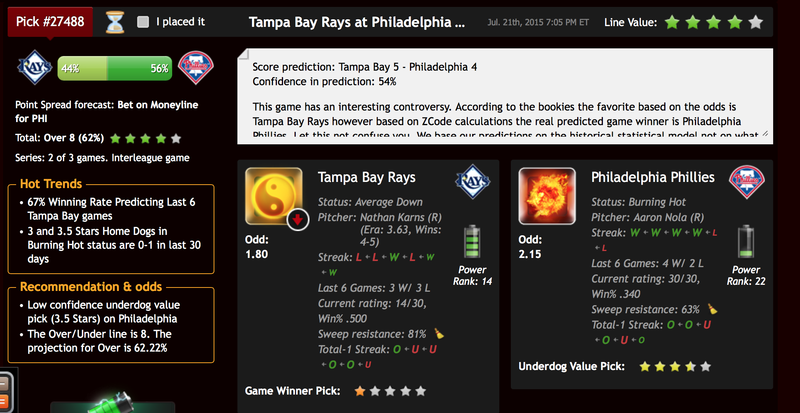 The score prediction parameter is on our side in a close game, expecting a 5-4 victory by the Rays with an over prediction that carries a 62% chance of victory and four stars of value. So, the computer likes the over and has some conflict about this one, and I’m on an AB Doubler progression on the Rays. Such hate for a team. A beautiful thing to see from an Oiler fan. wow did the lightning get hammered on this deal. In the standings I would like to see the Tampa Bay on top of the Philadelphia. Go Tampa Bay! Moore is the single reason that I love baseball! This team is NEVER very good in your eyes. Again26-15-3. No way. Gretzky for 3, Messier 2, Kurri pots 3 and Coffey 2. Bill Ranford with the shut-out. 10-0 Oilers. go Phillies!!!! i'm a fan and i am on it!!!! I think the Phillies will be more competitive. Agree. Someone mentioned earlier that Sather wins every trade he makes, but he got taken to the cleaners on that deal. Only time will tell if it will be more than 2005 but it's definitely comparable. That's an awesome team love the Rays! What a game! Awesome win for ! Yea maybe, but the Canucks are due to start their annual January collapse. They should be set for years to come. the difference between the panthers and lightning powerplay is day and nightjust. Stay out of the box or it's game over. I neglected to include the 22 shots the Oilers registered against the Hawks. Incidentally, finding an average does not mean running with the lowest number. will be lit up! ERA goes up! ridiculous how they make those predictions but never show up after the game when the Nucks win to face the music. Even Darryl Sittler wanted out of Toronto. baseball is simply money printing machine! Tampa Bay ROCKS!!! I'm on it! Huge win for Rays! Nice one! Tampa Bay Lightning off season to do list : Get some rest . So, take away Morrow and that's the lineup. I'm liking those 2.19 against the Philadelphia. I'll take some of that. Go Philadelphia Go! They are not old. The have a good mix at the moment. 4 forwards under 234 forwards 23-294 forwards 30-335 of 7 defencemen 29 or under. i am on Tampa Bay today!! anyone?? Let's see where the team ends up at the end of the season if trades aren't made. Looks great, i am on Rays, GO GO Rays!!!!! u the twin brother of phaneuf for norris. and claude lemiex was a good hockey player especially in the palyoffs. Just gotta keep believing in these Tampa Bay boys! Nola is superior obvisously!!! Nola will be destroyed again!!!! Welcome to the show Karns!! Go Tampa Bay!! !